We needed some cork backs for coasters and tiles we'd made over the winter. Instead of getting them done commercially, I decided to have a go at die-cutting them myself. It's very easy to do, once things are set up. I bought the steel rules from Partwell, who have a fantastic range of diecutting supplies and related equipment. They very kindly sent me a 1m sample of rule to try, which worked great for the initial die. The rules are 12mm wide and 0.53mm thick. There are different rules for cutting different materials, but soft materials like cork should be pretty forgiving. For the die board, I used 6mm MDF sheet. I used the laser to cut out a channel right through the board, with a width equal to the thickness of the rule. The rules will later be backed up with a metal plate in the press. Bending the rule is a bit tricky. It's impossible to bend reliably by hand, even with pliers, so I made up a simple V-groove thing for the bench press which lets me bend the rule into smooth curves. 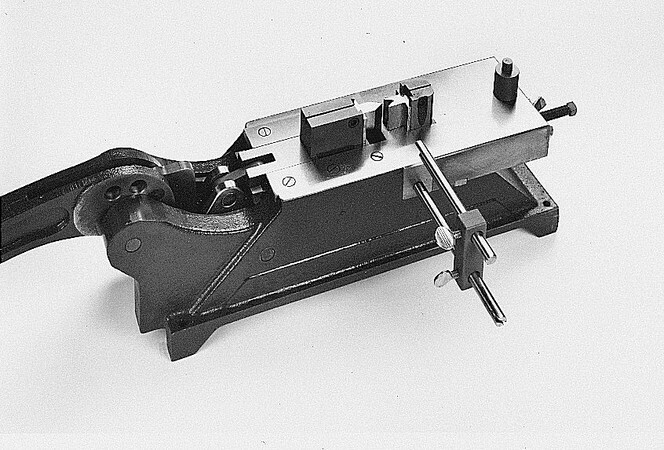 The proper tool for the job is this (from www.die-making.com) which can take a range of different bending dies. However, a lashup job is fine for simple bending. Once bent, it's hammered into the grooves in the MDF. Several thicknesses of foam are used to eject the cut material from the die. This is cut on the die itself first, and sticks in the die. Subsequent cuts are ejected by the foam. For a press, I'm using a 20 ton hydraulic press, but it can probably be cut with a lot less, maybe 2-3 tons. I'm using a piece of kitchen chopping board as a cutting board, which seems to work very well (I initially used a bit of acrylic, which soon cracked). I've also found it's possible to cut two thicknesses of cork at the one time, to speed things up. The self-adhesive cork is from Fred Aldous. Although the center piece of wood is actually completely separate, it's held rigidly in place by the spring of the steel rules and doesn't fall out. Lastly, if you're in the US, a good supplier for diecutting materials looks to be AmeriKen.